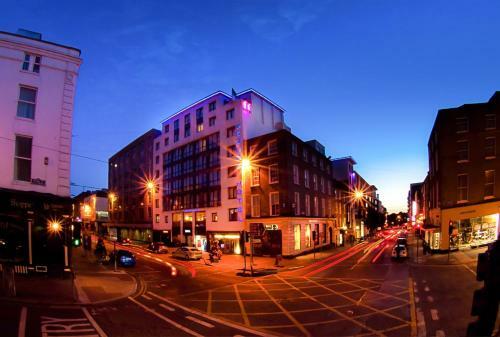 A sensationally chic hotel the Absolute Hotel is only minutes from the main shopping and socialising areas of downtown Limerick. Enjoy the spacious and comfortable surroundings of this design-led hotel with an individual style full of vivid and rich fabrics interesting artwork and handmade furniture. Absolute Hotel Limerick gives you a sense of space and easy living in a warm and inviting new place to be. Absolute satisfaction awaits in the Absolute Bar & Grill with floor to ceiling windows whilst you listen to the sounds of the flowing river. The restaurant specialises in top-class modern international cuisine and fresh seasonal produce. Meet your friends in Absolute Hotel s bar the perfect place to unwind and socialise at the end of a busy day with a glass of champagne or a cocktail. Treat yourself in Escape the Absolute which emphasizes quality attention to detail and unrivalled customer focus. It provides clients with bespoke treatments for relaxation wellness and beauty. Built on the philosophy that to spa is an absolute essential Escape believes you should eat well sleep well breathe well spa well! Come into the day spa for a single treatment or stay over and experience the full pampering effect. Checkin Policy : The credit card used to make the booking with the amount of the reservation plus available funds must be presented upon check-in. If no credit card is available then a debit card will be accepted. However full payment will be taken on check in and no credit facility will be available on your room. Clayton Hotel & Leisure Club Limerick Ireland s tallest hotel is superbly located in Limerick city centre overlooking Limerick s famous River Shannon. 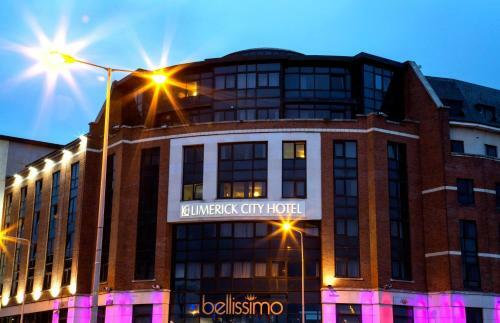 The hotel offers 158 beautifully designed air-conditioned rooms overlooking Limerick city and the river Shannon. The Restaurant at Clayton Hotel Limerick is without doubt one of Limerick s best loved eateries and is renowned for its warm inviting atmosphere and stunning views. A passion for fresh local seasonal produce mixed with exciting flavours is the ethos at the restaurant. The Bar at Clayton Hotel Limerick serves Oriental Food straight from the Wok with exotic flavours and spices. Choose from a selection of beers and wines from around the world. Whatever way you choose to keep fit whatever advice or instruction you need you ll find it at Club Vitae Health & Fitness including sauna steam room Jacuzzi pool and gym. Clayton Hotel Limerick also boasts a conference centre and wedding and events venue. 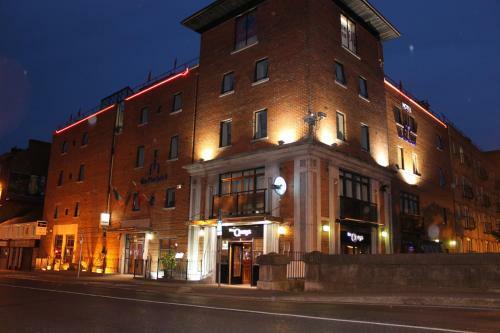 Clayton Hotel Limerick is located just a 5 minute stroll from the city s shopping and entertainment hot spots including to O Connell Street Thomond Park tourist attractions shops and nightlife all on the doorstep. Dolans Pub with traditional Irish music is located five minutes walk from the hotel. Conveniently located just 5 minutes from Shannon International Airport The Shannon Springs Hotel (formerly known as Shannon Court Hotel) is one of the most popular Shannon Hotels and boasts 54 very spacious tastefully decorated bedrooms with all the modern amenities to make you feel at home. Shannon Springs offers free WiFi and parking to all guests. Famous for our Old Lodge Gastro Pub friendly atmosphere and excellent efficient service there is an abundance of local attractions within easy reach of our Shannon Airport Hotel. The Shannon Springs Hotel is an ideal base for a great leisure break. Situated between the neighbouring historic towns of Ennis & Limerick. We are very close to the scenic Cliffs of Moher Craggaunowen and Bunratty Castle & Folk Park. Medieval Banquets and Irish Nights famous worldwide are not to be missed. We look forward to welcoming you to the Shannon Springs Hotel in the near future. The Great National Abbey Court Hotel in Nenagh is one of the Ireland s landmark 3-star hotels located in North Tipperary a town bursting with life and steeped in history. Just 30 minutes from Limerick City 90 minutes from Dublin via the new M7 exiting off Junction 24 60 minutes from Shannon International Airport via the Limerick Tunnel and 5 minutes drive from Nenagh Train Station. All 83 gues-trooms features include tea/coffee making facilities ironing amenities direct dial telephone hairdryer multi-channel TV complimentary high-speed broadband complimentary morning newspaper and complimentary fitness/leisure centre access. Free parking and Wi-Fi throughout the hotel is available. The Trinity Leisure Club at the Great National Abbey Court Hotel is equipped to the highest standards featuring a 20-metre swimming pool kiddie s pool spa sauna steam room and spacious Jacuzzi. The fully equipped and state of the art conditioned gymnasium features a free weights area exercise and fitness programmes aqua aerobic classes personal training and a sports injury clinic. The Abbey Court s Award Winning Abbot s Steakhouse is regarded as one of the finest restaurants in Nenagh and Tipperary offering an array of tempting Irish and European inspired dishes paired with an extensive range of delicious wines to compliment every meal. Popular attractions are nearby like Nenagh Castle Rock of Cashel and the University of Limerick Adventure Centre. The George Boutique Hotel Limerick is a luxury 4 star hotel located at the corner of O Connell Street and Shannon Street in Limerick. Inspired by leading boutique 4 star hotels around the world the property is located right in the city centre close to shopping entertainment and the commercial district. A luxury hotel that will not disappoint we boast an eclectic mix of contemporary style and comfort. Guests can experience the perfect match of cutting edge cosmopolitan boutique hotel style and an unparalleled standard of service in swish luxury hotel surroundings in the heart of Limerick City. Our accommodation is sure to impress even the most discerning traveller and it reflects the standard you would expect from a 4 star Limerick Hotel. Our central location will ensure that you have the perfect base to explore vibrant Limerick City. You enjoy: free overnight parking nearby Howley s Car Park (charges apply during day-hours) along with Free WiFi in our Luxury Boutique Hotel Limerick. The Savoy Limerick City Hotel is a luxurious boutique property ideally located in the heart of Limerick city. Each of our boutique guestrooms offer amenities that ensure a comfortable stay including luxurious bedding free wireless laptop safe and air-conditioning. For dining and entertainment the luxurious Liszt Lounge on the first floor provides a light menu and is the perfect place to enjoy afternoon tea. The Savoy Hotel Limerick Bar offers signature cocktails and is open nightly. Our partner restaurant Hamptons which is a New York style steakhouse is located next door and the award winning Market Square Brasserie is situated in the hotel. The Maldron Hotel Limerick is one of the most conveniently located hotels in Limerick City just off the Southern Ring Road and the M7. The hotel is also just 5 minutes drive from Limerick city centre with the Crescent Shopping Centre Raheen Business Park and the Regional Hospital all in close proximity. The Maldron Hotel in Limerick City is the perfect choice whatever the reason for your visit to the Treaty City. 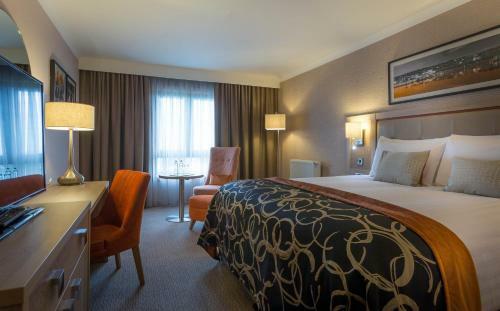 One of the best hotels in Limerick The Maldron boasts well appointed Limerick hotel accommodation the superb Club Vitae Leisure Club extensive dining options high quality conference facilities and a wide range of guest facilities. Travelodge welcomes you to the newest hotel in Limerick. The Travelodge Limerick Castletroy is a brand new 3 hotel neighbour to Limerick University Sports Arena and Concert Hall. The hotel is just 2 miles from Limerick City on the Dublin road Shannon International Airport just 20 minutes drive away. The Hotel is close to the University Concert Hall which is one of Limericks popular venues for some of Ireland leading acts and it is just 10 minutes walk from the hotel. Excellent views overlooking the city of Limerick. Free secure underground parking. Spacious family triple double and twin bedrooms available. We offer complimentary Bitbuzz WIFI in our reception area. Free Wi-Fi with unlimited data for all devices throughout the hotel. The main Castletroy shopping centre extends to some 90 thousand sq feet is located off Dublin road minutes walk from the hotel and includes Superquinn supermarket and 24 mall shops McDonalds restaurant and an 8-screen cinema. Cafe Noir Open 7:30 Last Orders 10pm Lunch menu from 12:30 Caf? Noir is a classic French Caf? concept offering made to order handcrafted products. An extensive dinner menu is now available featuring steaks fish and chicken from the char grill in the state-of-the-art open-plan kitchen. With a range of daily specials including fresh prawns sea bass and slow roast pork belly to name but a few every taste is catered for. Caf? Noir has developed a range of products that are unique to them & far superior to the standard fare available on the high street. Set in its own grounds close to Thomond Park Rugby Grounds Limerick Travelodge is ideally located for easy access to Shannon Airport Limerick City and is located at a key intersection for those travelling to Cork Kerry or Northwards to Galway. 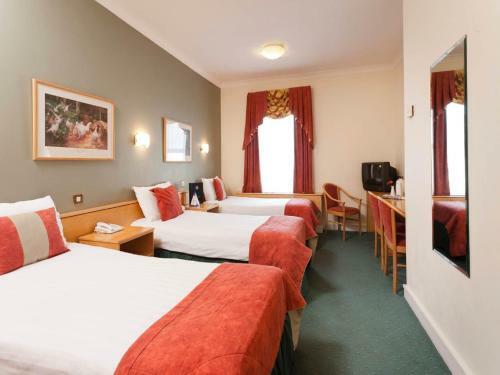 The Limerick Travelodge offers spacious modern rooms with unbeatable room prices. Prices quoted are per room with each room able to accommodate up to three adults and a child or two adults and two children. All rooms are en suite with TV s and have Tea Coffee Making Facilities. We offer complimentary Bitbuzz WIFI in our reception area. Free Wi-Fi with unlimited data for all devices throughout the hotel. The Travelodge offers complimentary parking. CCTV is in operation. Reception is open 24 hours a day. Valid ID must be shown on check in for safety and security reasons. The Great National South Court Hotel is one of Limerick s best Business and Leisure Hotels and offers the perfect base to explore Limerick and the Shannon Region. With an enviable location close to the City Centre minutes from the motorway network and approximately 20 minutes from Shannon Airport the South Court Hotel also offers the convenience of ample free parking and complimentary Hi-speed Wi-Fi. The Great National South Court Hotel features 124 spacious bedrooms including 28 Lifestyle Suites designed by acclaimed designer Paul Costello. All rooms feature multichannel TV direct-dial telephones and tea/coffee making facilities. Triple and Family Rooms are also available. Guests can enjoy complimentary access to our gym and a refreshing choice of dining options. Seasons Restaurant offers a delicious buffet breakfast and is served from 7am to 10am Mon-Fri and until 11am on weekends. Off The Bone Gastro Pub is a vibrant contemporary restaurant where combining great food friendly staff and a lively atmosphere is key to what we deliver. Boasting an extensive menu ranging from signature Aged Black Angus Steaks to Glenbeigh Mussels fresh and delicious salads to a mouth-watering selection of desserts as well as an array of cocktails and craft beers we are sure our food will tantalise your taste-buds. The award winning Cream Room Curry house offers authentic Indian Cuisine in a relaxed casual setting. Chef Lekhraij Kapil and his team fuse sophisticated flavours and expertise to create an authentic dining experience at value-for-money prices. Open from 5.00pm to 10.00pm Monday-Thursday 5pm-10.30pm Friday & Saturday and from 5pm to 9pm on Sunday. The Cream Room Coffee House - where We Proudly Serve Starbucks - opens daily from 06:30am (07:30am at weekends) and serves a delicious selection of homemade scones pastries sandwiches salads and confectionery. With one of the largest conference facilities in the region The Great National South Court Hotel offers unrivaled space and flexibility for meetings and events of all sizes. The conference centre can accommodate up to 1100 delegates theatre style and comes with fully integrated AV equipment and air conditioning. The space can also be subdivided into six rooms offering choice and flexibility for smaller meetings. There are also a number of additional meeting rooms in the hotel. Private dining options from informal gatherings to gala dinners product launches and award ceremonies can also be catered for. The venue features complimentary WiFi and over 400 parking spaces. Over 30 years in business our family run hotel is set on 44 acres of grounds near the village of Adare. Spacious bedrooms featuring goose down topped mattresses ensure restful sleep. Enjoy elegant dining in Fieldings Restaurant or traditional Irish food in Timmy Macs Bistro. Our Leisure Club comprises a 20m pool kids pool geyser pool lounger pool a cardiovascular gym and weights area a separate health suite with sauna steam room and Jacuzzi. Our award winning Revas Spa and Hair Gallery includes a thermal suite rasul chamber outdoor rock pool foot spa couples rooms hair salon and 18 treatment rooms. Woody s Fun Club is open during school holidays and most Saturdays. Close to Shannon airport and Limerick City our hotel is the ideal base for exploring Cork Killarney Ballybunion the Cliffs of Moher and Bunratty Castle and Folk Park. The landmark Treacys West County Conference and Leisure Hotel is one of the best hotels in Ennis just walking distance from the centre of town it is an ideal base to explore all the renowned tourist gems Clare has to offer: from the mysterious Burren to the charming Bunratty Castle and Folk Park to the world-famous Ailwee Caves and the towering Cliffs of Moher. Treacys West County Hotel is famous for its great quality and value and most recently a venue dedicated to entertaining the children making it an ideal choice for everything from short breaks to family holidays. Our brand new Mini T s Kids Club for example offers a packed entertainment programme for our junior guests including everything from arts and crafts to dance classes to Movie Time so Mum and Dad get a break also. Not forgetting our Game Zone which is a big attraction for the older kids including X-Box PlayStation video games and pool table. Treacys West County Hotel also offers spacious bedrooms each elegantly appointed with en-suite bathroom welcome tray and satellite TV complimentary Wi-Fi suitably designed for families not to mention the Health & Leisure Club is located within the hotel complex complete with: 20 metre deck pool with up to 4 swimming lanes Separate children s pool Leisure pool Thermal suite with jacuzzi steam room and Finnish sauna Aqua fit classes including a great choice of toning classes available for members and guests Swimming lessons for both adults and children. Whether you are looking for a 3 course gourmet meal a hearty breakfast or a mouth-watering carvey lunch the West County Hotel has something for all tastes when Dining in Ennis. With four food and beverage outlets we can satisfy all of your requirements. The Grill Room remains a firm favourite for many with its A La Carte menu Caf? West is the ideal place to catch up over a freshly brewed cup of coffee. Enjoy our daily carvery for a great value meal or dine in the Pine Room or enjoy bar food served in and Boru s Bar there really is something for everyone. And if you fancy getting out and about Ennis and County Clare have lots of things to see and do from the Ailwee Caves to the mysterious Burren to world-famous Cliffs of Moher! Historic and charming Ennis town centre is just 10 minute walk from the hotel. Welcome to The Lakeside Hotel & Leisure Centre in Killaloe on the County Clare and County Tipperary border. This Family Friendly Hotel is situated in a stunning location on the banks of the river Shannon proudly overlooking the twin towns of Ballina Co. Tipperary and Killaloe Co. Clare with its famous 13 arch bridge and 13th century cathedral St. Flannans. With its innate sense of peace and warmth it is often described by locals as Ireland s Best kept secret . The Lakeside Hotel & Leisure Centre in Killaloe County Clare is the ideal base for both leisure and business. Being only 20 kilometres from both Limerick and Nenagh just off the main Dublin to Limerick road (M7) the hotel is a perfect place to enjoy Midweek and Weekend Hotel Breaks on the River Shannon East Clare. Stay at the Lakeside Hotel which has been designed for your comfort and convenience. Our accommodation in Killaloe Co Clare offers 43 en-suite guest rooms ranging from single double twin and specially appointed family rooms. All our guest rooms are non-smoking and offer in-room amenities to ensure you have a pleasurable stay. Why not upgrade to our wonderful newly refurbished deluxe rooms or our lakeview rooms.Relax and unwind in our Leisure Complex with the most up to date exercise equipment and first class leisure facilities. The gym at the Lakeside Hotel & Leisure Centre hosts a complete range of cardiovascular equipment many with their own integrated entertainment systems. We have qualified gym instructors on hand who will be happy to design a fitness programme to suit individual needs. Why not relax in our sauna or steam room perfect to ease tired muscles promote relaxation and alleviate strains after exercise. The Kids will love our spectacular 120ft figure of 8 waterslide in our 17m Deck Level Pool. Hotel guests are welcome to avail of our leisure facilities at no extra charge. The Dunraven Arms is an oasis of tranquility - surrounded by mellow thatched cottages offering the ambience of a country house with first class service and friendly efficient staff. Dunraven welcomes you to our 74 bedrooms including 6 suites and 12 junior suites all beautifully appointed with antique furniture private dressing rooms and en suite bathrooms. The Maigue Restaurant has received the highest accolades for its outstanding cuisine. Our Inn Between Restaurant located in a thatched cottage opposite the hotel offers the finest traditional Irish dishes. The leisure centre comprises a 17m swimming pool therapy clinic massage rooms steam room and state-of-the-art gymnasium. We have been awarded AA Three Rosettes for Food Gilbey s Gold Medal Award Egon Ronay Irish Meat Restaurant of the Year RAC Hospitality Service & Comfort Award Mouton Cadet Award Bord Failte Awards of Excellence. The Great National Kilmurry Lodge Hotel is a quick 5 minute walk from the University of Limerick and the National Technological Park Castletroy. There is a bus stop located by the hotel gate which will bring you to Limerick City Centre in just 10 minutes. This charming family run hotel is set amongst 3 acres of manicured gardens offers guest rooms with power showers free Wi-Fi access plentiful free parking and full Irish breakfasts. The spacious rooms at the Kilmurry Lodge Hotel feature Interactive TVs hairdryers and irons. Tea/coffee making facilities are provided and there are free newspapers each morning at reception. Guests also receive discounted entry to the University Arena Ireland s High Performance Centre with its extensive gym and 50 metre swimming pool. An extensive Buffet Breakfast is served daily in Flannagans Restaurant from 7.00 am-10am. Carvery Lunch is served in Nelligans Bar each day followed by evening Bar Food Menu. Nelligan s Bar with its traditional Irish Pub culture serves the best locally sourced produce combined with friendly Irish hospitality and service. Please note Children s Breakfasts are available at the hotel: - Children under 3 years of age free of charge - Children age 3-13 : 6.50 for full breakfast or 4.50 if the child has only one item and drink Limerick Golf Club Unigolf centre and the University Concert Hall are all less than a 5-minute drive. The Kilmurry Lodge Hotel is Limerick s most convenient hotel with motorway connections from exit 28 off the M7 direct to Shannon International Airport (30 minutes) Dublin (2 hours) and Galway (1 hours and 30 minutes) and free 250 space car park. The Kilmurry Lodge Hotel also has its own helipad The hotel operates the following Children s Policy- - Children under 3 years of age staying free when using existing beds. An additional camp bed or cot are charged 10.00 per night. Children age 3-13 are charged 10.00 per night on room only basis & 15.00 per night on Bed & Breakfast Basis. Any additional older children or adults are charged 20.00 per night on room only basis & 30.00 per night on Bed & Breakfast Basis. The Kilmurry Lodge Hotel is a non-smoking hotel and this policy is strictly enforced. A minimum penalty of 100 will be imposed on guests found to be in breach of this policy. The Pier Hotel has views of the River Shannon and is located in the centre of Limerick, with a bar, a restaurant and free WiFi. The Quays Restaurant is a sports-themed venue with a large selection of drinks and a bar food menu. The George is a boutique hotel on O’Connell Street in Limerick city centre. It has air-conditioned rooms with free internet access, and a restaurant serving Italian cuisine. 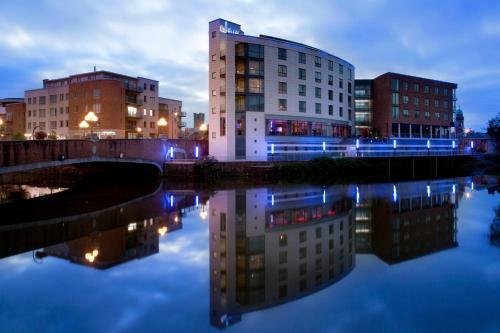 Situated in the heart of Limerick, the 4-star award-winning Limerick Strand Hotel is next to the River Shannon. The luxurious hotel offers spacious rooms, a steam room, and 2 hot tubs. Shannon Airport is a 20-minute drive away. The Boutique is located in the heart of Limerick city centre, beside the pedestrian shopping area, close to pubs, restaurants, cafes and local attractions. 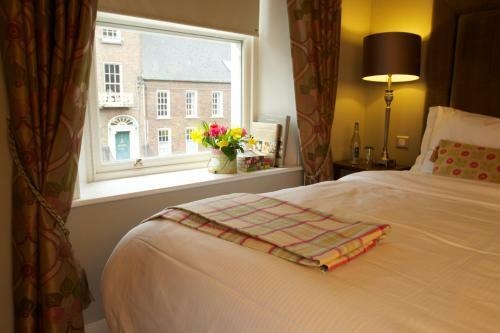 The Boutique offers comfortable en suite rooms and free WiFi. 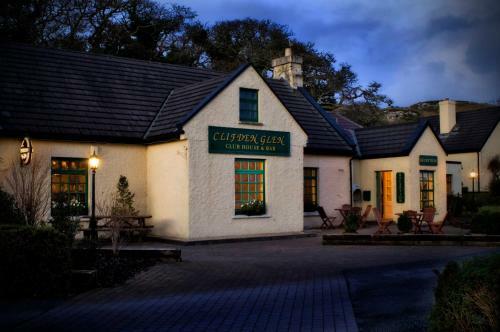 Clifden Glen Cottages is situated in Limerick, 600 metres from The Hunt Museum. St. John's Hospital is 800 metres from the property. There is also a dining area and a kitchen fitted with a dishwasher, an oven, and a microwave. Situated in Limerick, Quay Apartment Limerick offers self-catering accommodation with free WiFi. The apartment is 700 metres from The Hunt Museum. The kitchen is fitted with a dishwasher, an oven and a microwave, as well as a kettle. Bishops Quay Apartment offers accommodation in Limerick, 800 metres from The Hunt Museum. The property features views of the garden and is 1 km from St. John's Hospital. Free WiFi is featured throughout the property. Boasting a relaxing sauna and modern gym, Pery’s Hotel is situated in the heart of Limerick’s shopping district in the historic Georgian quarter. With free WiFi and there is live music every weekend. 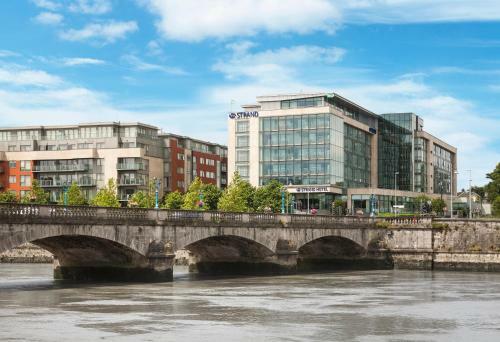 With views over the River Shannon, Limerick City Hotel is in the heart of the city centre, 5 minutes’ walk from Colbert Bus and Train Station. It offers spacious rooms with TVs, a restaurant and bar along with free WiFi available throughout. Overlooking the Abbey River in Limerick’s Medieval Quarter, this luxurious Absolute Hotel boasts chic, stylish rooms with 32-inch plasma TVs. Spacious rain showers are provided in each modern bathroom. This boutique town house is close to Limerick city centre and opposite Pery Square (Peoples’ Park). It offers free wired internet, luxury rooms and organic spa treatments. No. In Limerick city centre, this modern Clayton Hotel is Ireland's tallest hotel and it offers stylish rooms with views of the River Shannon. Guests have free use of the luxury health club. ee. On the River Shannon’s banks stand the remains of King Johns Castle, still an imposing monument today. The medieval cathedral in which Cromwell's army stabled their horses in 1651 is visited by people from all over the world who are keen to survey the ancient interior and contemplate in awe the turbulent history those walls have seen. For a pleasant place to stroll, walking past the Georgian terraces on O'Connell Street in the heart of the city is highly recommended. Limerick boasts a good choice of restaurants, bars and clubs and has a Millennium Theatre for live entertainment, drama and comedy. Limerick Hotel, Limerick Bed and Breakfast, Limerick Cheap Hotel accommodation suitable for a Limerick Weekend Break, a Limerick City Break, Limerick Wedding Accommodation, Limerick Guys Night out, Limerick Girls Night out or even a Limerick Stag Party Stag Night or a Limerick Hen Night. Shannon Airport— Fly to and from Limerick via Shannon Airport from all over europe and stay nearby for that early flight.